The Lincoln Stars will be back in the friendly confines of the IceBox this weekend with back-to-back games against the Muskegon Lumberjacks. The puck will drop at 7:05pm CST for the Friday and Saturday night home games. Before I get to this weekend preview, I want to apologize for the lack of game recaps last weekend. Real life got in the way of blogging, and I had zero time to devote to the B³. I also missed both home games last weekend, so my recaps wouldn't have been that lengthy anyway. But I'm back in the saddle now, and ready for the two upcoming games against the Lumberjacks. The Stars enter this weekend with a record of 1-2-0 in three games played so far in the regular season. These two upcoming home games at the IceBox will complete a five-game home-stand to start the 2014-15 season for Lincoln. Lincoln is coming off an up and down couple of games last weekend in which they played very well in a 4-3 overtime shootout victory over the Sioux City Musketeers, but then fell flat against the Waterloo Blackhawks in a disappointing 4-1 loss. The Stars had 38 shots on goal against the Muskies, but only 20 against the Blackhawks. 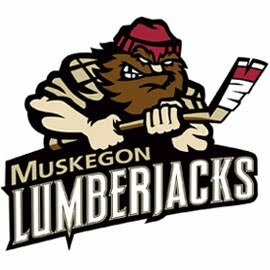 Lincoln's foe this weekend, the Muskegon Lumberjacks, sport a record of 3-2-0 in five regular season games so far this season. After starting the season 3-0-0, the Lumberjacks have lost two straight and were outscored 10-3 in those two road games against the Cedar Rapids Roughriders. Even those these two teams are meeting for the first time this season, the Stars and the 'Jacks are pretty familiar with each other so far. In the preseason, Lincoln and Muskegon played two games against one another. At the 2014 USHL Atlantic Challenge, the 'Jacks beat the Stars by a score of 4-2. A few weeks later at the 2014 USHL Fall Classic West, Muskegon walloped Lincoln by a score of 7-2. I've mentioned this in other blog articles, but the Stars and the 'Jacks have been frequent trading partners as of late. Current Stars GM Jon Hull was Muskegon's assistant GM before coming to Lincoln, so that might explain why both teams have swapped a number of players. Current Stars Connor Frantti, Blake Christensen, Cam Lee, and Grant Jozefek were all property of the Lumberjacks at some point in the past. Current 'Jacks (and former Stars) Tommy Marchin and Daniel Willett will be playing at the IceBox for the first time this weekend as members of the opposing teams. Willett was traded to Muskegon during the 2013-14 season, while Marchin was traded at the conclusion of the regular season. So far this season, Willett has one assist for Muskegon through five games, while Marchin has four points (2g, 2a) in five games. The two games this weekend against the 'Jacks should be another good test for this young Stars squad. Just like Lincoln's first three opponents (Tri-City, Sioux City, Waterloo) this season, I think Muskegon is also a playoff team once the 2014-15 regular season campaign is complete. They are an extremely deep team, and have probably the best pure goal-scorer in the USHL right now in forward Matheson Iacopelli. Through 58 games last season for Muskegon, Iacopelli racked up 41 goals, including 12 on the powerplay. Stars head coach Chris Hartsburg took his team to task during his radio interview with Mike Melbye after the 4-1 loss this past Sunday evening to Waterloo, so it will be interesting to see how the players respond against Muskegon. I'd expect the Stars to come out with their hair on fire Friday night to start that particular game. There's no excuse not to be at the IceBox this weekend if you are a hockey fan living in Lincoln. Come on down and support the boys. What did coach say after the Waterloo lose? I couldn't hear the comments due to the stream being football. Would love to know what he had to say. Chris pretty much called them out and said they lacked effort and tried to get into a skilled game with Waterloo and that is not their game. I'd think getting called out like that should have gotten their attention. I'm anxious to see how they start out tonight after what I'd guess was a good week of practice.